Kathy is a senior business trial attorney with more than 25 years experience prosecuting and defending claims for clients involved in Ponzi scheme matters and in bankruptcy proceedings. Kathy’s practice includes recovering assets for clients in complex fraud cases under standard fee and alternative fee arrangements. Kathy also serves as a mediator in bankruptcy matters, in complex business disputes, and in matters requiring an expert on fraud or Ponzi schemes. Below is a summary of the activity reported for March 2019. The reported stories reflect at least 8 new Ponzi schemes worldwide; at least 6 guilty pleas, about 50 years of newly imposed sentences for people involved in Ponzi schemes; and an average age of approximately 53 for the alleged Ponzi schemers. Please feel free to post comments about these or other Ponzi schemes that I may have missed. Richard K. Booy, 50, was sentenced to 5 years in prison for defrauding at least 15 clients out of more than $1.4 million. The scheme was run through Principal Financial Strategies LLC and Safe Financial Strategies Inc. Booy promised no-risk investments and guaranteed returns. Most of Booy’s victims were elderly, and Booy diverted the invested funds to cover his personal expenses and to make payments to earlier investors. George Bussanich Sr., 60, George Bussanich Jr., 39, and Wilma Bussanich, 58, pleaded guilty to charges that they ran a $7 million fraudulent scheme. First, they sold 26 investors unregistered investments in a fictitious surgery center called Metropolitan Ambulatory Surgical Center, LLC. When they were caught and agreed to settle, they then convinced 18 of the 26 investors to invest another $3 million in a phony company called Global Fund Management. Others involved in the scams are Heidi Francavilla, 60, Robert Schooley, 67, Christopher Hanna, 37, and attorney Bryan Nazor, 47. Danny Butler, 70, of Kentucky, was sentenced to 8 years in prison and ordered to pay almost $1.3 million in restitution in connection with an alleged Ponzi scheme. Butler, an attorney, used his position to steal funds from his estate and general civil law practice clients. Butler incurred gambling losses of about $1.5 million during this same period. Jeffrey Carpoff and Paulette Carpoff had their assets forfeited by authorities in connection with an alleged scheme that they were running through DC Solar. The scheme involved mobile solar generators, and the individuals running the company are accused of diverting most of the investment dollars to fund their personal expenses, including vacation homes, $19 million worth of private jet trips, 90 cars and tickets for a $782,000 luxury box at the Las Vegas Raiders stadium-to-be. DC Solar has filed for bankruptcy. Amrit Jaswant Singh Chahal, 31, of Virginia, was sentenced to 2½ years in prison in connection with a $1.3 million investment scheme that he ran through his company, Kane Capital LLC. Chahal promised investors returns of 28% to 34% annually, falsely reported Kane Capital’s earnings, falsified brokerage statement, and diverted investor funds for his own personal use. Chalal promised returns from investments in the purchasing, trading, or otherwise investing in commodities for future delivery and other financial instruments. Carl Chen, of Delaware, pleaded guilty to charges that he ran a Ponzi scheme through his company, Chenmax Properties, Inc., a Delaware Real Estate Investment Trust, promising to invest his clients’ funds in real estate with 10% to 15% annual returns. About $3.32 million was invested in the scheme. Randall Crater, 48, was arrested on fraud charges relating to his cryptocurrency company, My Big Coin. About 28 investors paid in about $6 million. Crater claimed that his cryptocurrency would be backed by $300 million in gold reserves, but there were never any gold coins or gold assets. The CFTC charged the company with fraud in 2018. Christopher Dougherty, of California, was accused of running a $6 million Ponzi scheme. Dougherty was a financial investment advisor and would recommend to clients that they take money out of investment accounts and place the funds in private placement accounts. Clients started seeing red flag warnings signs of problems, such as bounced checks. William Neil “Doc” Gallagher, 78, of Texas, a religious radio host and financial adviser, was indicted on charges that he stole at least $19.6 million from about 60 senior citizens. The alleged scheme was run through Gallagher Financial Group, Inc., and W. Neil Gallagher, Ph.D. Agency Inc. Gallagher, who marketed himself as “The Money Doctor,” falsely claimed to be a licensed investment adviser and promised guaranteed, risk-free returns of 5% to 8% from investments in Diversified Growth and Income Strategy Account. The SEC also charged Gallagher and his companies with securities violations. Cameron J. Hager, 43, of Missouri, was sentenced to 8 years in prison and ordered to pay about $3.2 million in restitution in connection with a cattle Ponzi scheme run through 5A Holdings LLC. The scheme defrauded 92 investors by promising them returns ranging from 23% to 28% from investing in a cattle fund. Investors gave money to Hager to purchase herds of cattle that Hager said he could sell for a substantial profit. Hager used the money on personal expenses and to buy cars and trailers and to make his mortgage payments. Konstantin Ignatova, 38, was arrested on charges relating to OneCoin, Ltd., an alleged cryptocurrency Ponzi scheme founded alongside his sister, Ruja Ignatova, 33, and others. Ruja remains at large. It is reported that between 2014 to 2016, OneCoin took in approximately $4 billion in sales revenue, and claimed profits of approximately $2.5 billion. OneCoin claims to have 3 million members worldwide. Mark S. Scott, 50, is alleged to be a party to the money laundering operation, helping the company to launder more than $400 million through accounts in the Cayman Islands and the Republic of Ireland. He was arrested in September. Scott Kohn, 64, of California, was indicted in connection with an alleged $300 million Ponzi scheme targeting pension holders. The scheme was run through Kohn’s company, Future Income Payments, which collected monthly payments from pensioners “in exchange for a lump sum payment or loan.” Many of the 2,600 victims were veterans, and they were promised returns of between 6.5% and 8%. Kohn had pleaded guilty in 2006 to separate felony charges relating to trafficking in counterfeit goods. Daniel Todd Levine, of Colorado, was banned by FINRA from working in the securities industry. Levine had been serving as a Bitcoin broker, working alongside his brother who is a long-time U.S. fugitive residing in Europe. The alleged scheme brought in about $2 million. Levine consented to sanctions without admitting or denying his guilt. William B. McHenry, 71, pleaded not guilty to charges relating to his involvement in the scheme run by Arthur Lamar Adams, who previously pleaded guilty and is serving a 17-year sentence. McHenry is alleged to be a salesperson in the scheme who sold bogus timber rights for Madison Timber Properties. McHenry allegedly sold more than $18 million in investments to more than 25 people and operated a company called First South Investments. The Madison Timber scheme involved $85 million and defrauded more than 250 investors. Raymond Montoya, 70, of Boston, was sentenced to 14 years in prison for running a Ponzi scheme through a pooled hedge fund called RMA Strategic Opportunity Fund LLC. Montoya was a hedge fund manager who defrauded friends, family, and other investors out of millions of dollars. Montoya defrauded investors out of $38 million, telling them he was investing in stocks and bonds. Montoya used most of the money to purchase a Lamborghini, Rolls Royce, a few Ferraris, and a few Porsches, to pay his children’s student loans, and to pay his home mortgage. Patrick O’Connor, 61, of Wisconsin, agreed to plead guilty to charges that he was running a scheme through Madison Financial Services LLC. O’Connor took in about $12.5 million from investors who thought he was investing in securities. Instead, he spent the funds on real estate, personal expenses, and dividends to other investors. Carol Ann Pedersen, 66, pleaded guilty to charges in connection with an alleged $40 million Ponzi scheme that defrauded investors out of about $27 million. Pederson, a certified public accountant, defrauded more than 50 people by persuaded them to invest with her even though she was not a licensed investment advisor. She solicited her accounting clients’ investments through two types of investment opportunities that she offered: “Time Deposit” and “Client Pool.” The victims were told that Time Deposit would invest in low-risk securities providing a fixed return on their money after a period of time while Client Pool would invest their money in the stock market through an investment pool Pedersen had established with other investors’ funds. Leon Vaccarelli, 42, of Connecticut, was charged in connection with a scheme that involved more than $1 million. Vaccarelli was a financial advisor who told his clients that he was investing their money, but he instead used the funds for his personal and business expenses. Kent R.E. Whitney, 37, and Pastor David Lee Parrish, 47, of California, were the subject of charges brought by the SEC against them and their purported church, The Church for the Healthy Self (CHS) in connection with an alleged $25 million Ponzi scheme. The scheme was also run through CHS Asset Management Inc., a Texas corporation. The church’s website appears to be a “virtual church” but the primary mission of the church appears to be obtaining investors funds, according to the SEC. Whitney formed The Church for the Healthy Self in 2014, three months after being released from prison for defrauding investors in a $600,000 commodity options investment scheme that he ran with Parrish. The SEC alleges that the guaranteed profits promised to investors were as high as 43% and that Whitney and Parrish stole millions of dollars. Michael Wright, 42, of New Jersey, was sentenced to 21 months in prison in connection with the ticket selling scheme run in which Craig Carton was involved. Carton raised $2 million from a hedge fund, Brigade Capital, to be invested in tickets, but Wright, a financial manager for the business, diverted funds to pay down his home equity line and to pay Carton’s gambling debts. Timothy Ray Carruthers, 60, was sentenced to 6 years after he pleaded guilty to charges last month. He defrauded 35 people in a scheme involving bogus mortgage loans. Carruthers represented that investor funds would be used to provide borrowers with bridge mortgage financing through his company, Wakina Consulting Inc.
Antaryami Behera of GAH Multi Trade Private Limited and two others were arrested in connection with an alleged scheme that defrauded investors out of around Rs 26. Authorities have arrested four more people in connection with CashCoin, a fake cryptocurrency scheme run by mastermind Ashok Goyal Jaipuria. In addition to Jaipuria, Asif Malpani, Pradeep Arora and Baljit Singh Saini have been detained. The scheme involved about $14.5 million. Last month, Alpesh Barodia, 32, KiranKumar Panchsara, 38, Sanjay Sontakke, 44, and Rajnikant Kumavat, 46, were arrested. Garret Hevey aka James Baker, 43, and David Peile aka David Marshall, 42, were accused of running a Ponzi scheme that involved more than €5 million. The forestry investment scam was run through Arden Forestry Management. About €5.5 million was deposited with the company from about 143 investors. The investments would have required that around 858 acres of land be serviced, but the company only owned 30.2 acres. Masato Doko, 41, Tokiji Nakamura, 66, Teruhisa Miyoshi, 60, and several others were charged on allegations that they were running a Ponzi scheme through Texsear Japan Holdings. The scheme promised interest of 3% on investments in increments of one million yen. Texsear held seminars entitled “The Assembly to Energize Japan” to solicit investments. Ricardo Rocha, a Brazilian who founded Velox 10, took hundreds of millions of shillings from Kenyan investors in a cryptocurrency scam. Velox 10 promised unrealistic returns from bitcoin, and investors had to pay a membership fee and upgrade fee (about $300) and the amount of profit for investors was supposedly tied to the fees paid initially. Other investors were promised returns of 30% to 50%. The website for Velox 10 has been closed. Growing Circle International (G-Circle) was shut down by the SEC on charges that it was engaged in a Ponzi scheme. Kelvin Clive Wood, 69, pleaded guilty to charges relating to a fraudulent scheme run through Forex (NZ) Limited and Forex NZ 2000 Limited. Wood defrauded 18 clients out of more than $7 million. Joshua Paul Johnston, 35, was sentenced to 5 years in prison. The scheme brought in about $3.4 million and left investors with about $2 million in losses. He told investors that he was starting a business installing electronic equipment and that investors would receive a return on their investments. Johnston pleaded guilty last year. Regulators shut down nine Ponzi cryptocurrency companies. The SEC of Pakistan issued the following statement: “The SECP has advised public not to be misled by any schemes/deals/plans being offered by these companies: Gold Transmit Network Technology (Pvt.) Limited, Green Apple Super Market (Pvt.) Limited, Galaxy Typing Jobs (SMC-Pvt.) Limited, 3-A Alliance (Private) Limited, Pak Memon Impex (Private) Limited, Memon Corporation (Pvt.) Limited, Humanitas Meritus (SMCPrivate) Limited, IDG Enterprises (Private) Limited and Ayat Enterprises (Smc-Private) Limited. The Securities and Exchange Commission made its cease and desist order against Kapa-Community Ministry International Inc. (KAPA) permanent. KAPA, a religious organization, offered and sold securities in the form of investment contract that were disguised as donations. KAPA encouraged members to “donate” any amount in exchange for a 30% monthly return. KAPA also operates as KAPA Kabus Padatuon (Enrich the Poor), KAPA/ KAPPA (Kabus Padutoon), KAPA-Co Convenience Store and General Merchandise, and KAPA Worldwide Ministry. Mehmet Aydin, 26, was indicted, along with about 47 others, in connection with the Ciftlik Bank Ponzi scheme. Ciftlik (Farm) Bank was an online virtual farming simulator that offered investors generous returns. Aydin and his brother, Fatih Aydin, remain at large. Kittikorn Wanwasuthon, 61, was arrested in connection with an alleged Ponzi scheme that defrauded victims out of three billion baht through Coffee Cash Bank Co. The scheme promises investors 105% interest per month. Thai police requested the arrest, but another suspect, Sirawanphon Chaiwacharakhup, 52, managed to escape. General Electric Capital Corp. yesterday reached a $49 million settlement to resolve claims that it allegedly covered up the Thomas Petters Ponzi scheme. The trustee of two Florida hedge funds alleged that they lost $650 million in connection with the Petters scheme and sought damages from GECC’s alleged misconduct in conspiring to commit fraud by not disclosing the Petters scheme. Investors in Lancelot Investors Fund were given permission to purse their lawsuit against RSM in connection with the $3.65 billion Ponzi scheme run by Thomas Petters. Below is a summary of the activity reported for February 2019. The reported stories reflect at least 3 new Ponzi schemes worldwide; about 39 years of newly imposed sentences for people involved in Ponzi schemes; and an average age of approximately 54 for the alleged Ponzi schemers. Please feel free to post comments about these or other Ponzi schemes that I may have missed. Donato Baca Jr., 36, Jonny Ngo, 32, and NL Technology LLC were charged by the SEC in connection with an alleged $61 million Ponzi scheme that defrauded over 350 investors. The scheme promised returns from NL Technology’s wholesale technology import business. Without admitting or denying the charges, Baca consented to judgment permanently enjoining him from any future securities violations and ordering him to pay $4.7 million in disgorgement along with interest and penalties of over $1 million. Jeff Carpoff and his company, DC Solar Inc., were accused by the FBI of running a Ponzi scheme. DC Solar sold solar panels to supply emergency power to cell towers and to provide lights at sporting events. The FBI alleges that it was running an $800,000-plus Ponzi scheme. Carpoff and his wife, Paulette Carpoff, touted the tax benefits of investing in alternative energy in luring in investors. The company filed bankruptcy this month as well. Homero Joshua Garza, 33 was sentenced to 21 months in prison for his involvement in the PayCoin cryptocurrency scheme that defrauded investors out of $9 million. Todd Hitt, 54, of Virginia pleaded guilty to charges related to a $20 million Ponzi scheme. Hitt falsely claimed that his firm, Kiddar Capital, managed $1.4 billion in assets. The scheme involved various real estate projects, but Hitt improperly commingled funds and used investors funds for personal expenses like vacations and sports tickets. Patrick Joseph Kiley, 80, lost his appeal of his 20-year sentence for his involvement in the Trevor Cook Ponzi scheme. The Eighth Circuit found that Kiley’s challenge based on ineffective assistance of counsel and alleged potential conflicts of interest of his counsel was not sufficient to reverse his sentence. Kiley, along with Cook ran a $193 million Ponzi scheme. Edward Lee Moody, 47, was sentenced to 13 years in prison and ordered to pay $4.8 million in restitution in connection with a Ponzi scheme run through CM Capital Management LLC. Moody solicited about $6.6 million from 55 investors, some of whom were elderly and liquidated the retirement accounts so they could invest. Moody did not actually buy and sell securities for the most part, but instead used the money for his personal benefit. James Nickels, 67, of Wisconsin, reached a plea agreement regarding charges that he ran a Ponzi scheme through The Fiscal Concierge. Nickels had collected more than $5 million from at least 35 investors to whom he had sold promissory notes. The investors’ losses totaled about $3 million, and Nickels was ordered to pay $3.6 million in restitution. Niket Shah, 26, of New Jersey, and his company, Spark Trading Group LLC, who had been charged by the SEC in connection with an alleged Ponzi scheme that brought in $250,000, were the subject of a final judgment. The scheme involved a binary options trading account. The judgment permanently enjoins them from further violations of security laws and orders them to disgorge about $300,000. Robert Shapiro, Jordan Goodman, Albert Klager, Ferne Kornfeld and Barry Kornfeld were permanently banned by the SEC from ever working as brokers or investment advisors due to their selling unregistered securities for Woodbridge Group of Companies. The $1.2 billion Ponzi scheme defrauded 8,400 investors by selling them unregistered promissory notes and securities in supposedly low-risk investments in luxury real estate. Shapiro alleged spent around $21 million of investor funds on personal expenses and luxuries, and the Kornfelds, Goodman and Klager netted a total of over $7.4 million in commissions. Floyd Powell was also barred by FINRA; he sold Woodbridge notes to 13 investors and consented to a settlement without admitting or denying the allegations. Shawn Patrick Watkins, 48, was sentenced to 51 months in prison in connection with a Ponzi scheme that he ran with Angel Bronsgeest, 55, through The Equity Growth Group and Investors Workshop Inc. They promised investors returns from real estate deals but diverted funds for their own use. Watkins conducted monthly seminars in which he offered investments in bridge loans to acquire properties. Guy Aplogan and Ludovic Dohou, both senior directors of ICC Services, an investment firm, were jailed for 10 years for a scheme that may have defrauded more than 150,000 out of more than 150 billion CFA francs. The scheme promised returns of 150% to 200% per quarter. About $136 million worth of cryptocurrency supposedly held by QuadrigaCX is missing. Stockholders say that the holdings are stuck in an electronic vault because the company’s founder and sole employee died without sharing the password. Researchers say that publicly available transaction records suggest that the money may be gone. Timothy Ray Carruthers, 59, pleaded guilty to running a $5.3 million Ponzi scheme. The scheme involved fake bridge mortgage loans. Only about $1.7 million of the funds were repaid. Yan Zhu aka Rachel Zhu and Guan Qiang Zhang had their bank accounts seized in connection with an alleged Ponzi scheme that defrauded 464 people. The scheme was run through Bossteam E-Commerce Inc., which described itself as an online advertising business. About $4.8 million was used to pay administrative penalties in connection with the case. Arnold Breitkreutz, 70, and Base Finance Ltd. were ordered to pay more than $4 million in penalties in connection with a Ponzi scheme that brought in $137 million from investors and left them with $122 million in losses. Office administrator Susan Elizabeth Way, 67, was ordered to pay an administrative penalty of $150,000 and to disgorge $362,000. Wealth Drive Ghana Limited, Global Coin Help Limited, and TCL Market Ghana Limited were allegedly operating a Ponzi scheme and had promised returns of between 10% and 30%. More than 9,000 Ghanians invested in the scheme. The companies have been arraigned for prosecution for operating without licenses. Masato Doko, 41, and Keizo Adachi, 58, along with 8 others, were accused by the police of running a Ponzi scheme through Texsear Japan Holdings. The scheme brought in ¥46 billion from 13,000 investors. The company held seminars titled “The Assembly to Energize Japan” to solicit investors and promised returns from “businesses that are expected to grow rapidly.” Tokiji Nakamura, 66, and Teruhisa Miyoshi, 60, are among the eight in custody. The SEC shut down Dantata Success and Profitable Company, which was carrying out capital market activities without proper registration. The company promised investors returns of between 25% and 50% from supposed returns in trading, oil and gas, transportation and import, export. Hajiya Basira Dantata started the business as a family business and the reported business was to solicit funds from investors. The SEC shut down Growing Circle International Limited, an international advertising company with headquarters in the U.S. The company allegedly engaged in illegal fund management activities that are described as a Ponzi scheme. Jacques Magliolo was accused of running a Ponzi scheme through his business, Business Consultants International. Magliolo, who has published more than 17 books on investment advice, denies the charges. Thirty investors filed complaints against CryptoMining.Farm, a cryptocurrency cloud mining company. The scheme allegedly defrauded 140 victims out of more than $1.3 million. The company is believed to be operated by Lifetime Technology Co. Ltd. and is linked to possible owner, Pimongkol Tawpibarn. The scheme may have promised guaranteed returns of 70% per year. The receiver over ClearPath Wealth Management LLC filed a motion to include former employee, and former House Minority Leader, Patricia Morgan, as an insider. Morgan was an employee but has appealed the designation of her as an “insider.” Patrick E. Churchville, the owner and president of ClearPath, was sentenced to 84 months in prison for orchestrating the $21 million Ponzi scheme that defrauded more than 110 investors. The Second Circuit revived billions of dollars of lawsuits brought by the Trustee in the Bernard Madoff Ponzi scheme by permitting the lawsuits seeking to recover transfers of assets made overseas. The trustee had sued foreign investors for recovery of funds that had initially been paid to foreign feeder funds, and the court found that a foreign subsequent transferee could be sued to recover property that had been transferred to it by a foreign initial transferee. Wells Fargo was dismissed from multidistrict litigation brought against it by investors in the Telexfree Ponzi scheme. Investors in the scheme run by United Development Funding III filed a proposed class action to recover their losses in the failed real estate lending scheme. The FBI is soliciting information from investors in Bitconnect, using a voluntary questionnaire to acquire information about their interaction with Bitconnect. Kathy has significant experience with the issues arising in Ponzi scheme cases, and in tracing and recovering assets in complex fraud cases. She has represented all types of parties in Ponzi scheme cases, including investors, defendants in litigation, trustees, and receivers. She has extensive litigation experience in a wide variety of bankruptcy litigation matters, representing operating and liquidating trustees, debtors, and secured and unsecured creditors. Kathy also serves as a mediator in bankruptcy matters, in other complex disputes, and in other matters requiring an expert on fraud or Ponzi schemes. 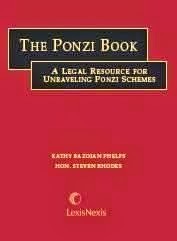 Endorsements for "The Ponzi Book"
All blog entries posted on this site are published for general informational purposes and do not constitute legal advice, nor create an attorney-client relationship between the author and the reader. The blogs may not be updated to incorporate changes in the law or facts after the date of publication on the site, and therefore, any information contained therein should be checked to assure accuracy. Comments made to blog entries posted on this site will be published if they relate to Ponzi schemes issues, advance the discussion of the issues in a productive fashion, and maintain a civil tone. Other comments and those not made with an acceptable standard of professionalism will not be published. Copyright 2012 - 2016 Kathy Bazoian Phelps. Powered by Blogger.